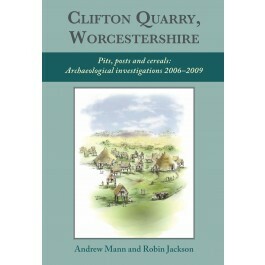 Between 2006 and 2009 Worcestershire Archaeology completed a series of investigations in advance of quarrying at Clifton Quarry, Worcestershire revealing one of the most important sequences of prehistoric to early medieval activity discovered to date from the Central Severn Valley. Well-preserved palaeoenvironmental deposits were recovered from features and associated abandoned channels of the River Severn. Analysis of this evidence is underpinned by a comprehensive programme of scientific dating, providing a record of changing patterns of landuse and activity from the Late Mesolithic onwards. Significant discoveries included a series of Grooved Ware pits and an extensive area of Early to Middle Iron Age activity. One of the Grooved pits was of particular importance as it contained an exceptionally rich material assemblage comprising two whole and four fragmentary polished axes, numerous flint tools and debitage, significant quantities of Durrington Walls and Clacton Style pottery, and abundant charred barley grains and crab apple fragments. The Early to Middle Iron Age activity was notable since unusually for a lowland site it was dominated by in excess of 100 four-post granary structures and 130 pits. The full extent of the activity was not established but it appears unenclosed and it is suggested that this represents the specialised storage zone of a much larger settlement. Phases of activity on the floodplain and terraces adjacent to the river also included a Bronze Age burnt mound with associated pits and a trough, a scatter of Romano-British features and an early medieval timber-lined structure associated with flax retting.